MUCH of the work needed to transform Barrick Gold Corp. had already been done by chairman John Thornton making the task of newly appointed CEO Mark Bristow that much more manageable following the firm’s merger with Randgold Resources. According to Bristow, this helped in particular regarding corporate culture which was frequently a barrier to a successful merger. 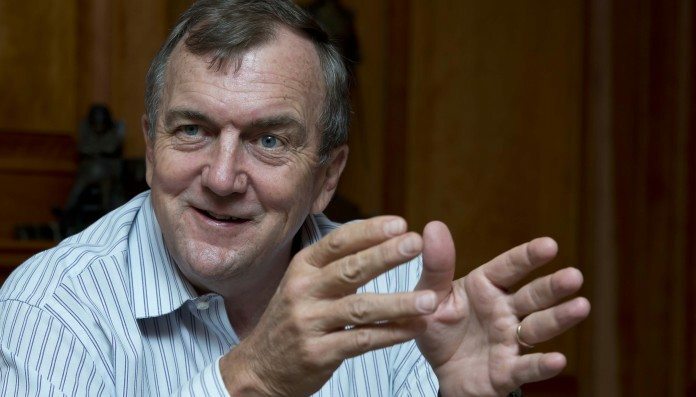 “John had recognised, as a complete outsider, the inefficiencies of the mining industry and his mantra was to get Barrick ‘back to the future’; back to the early Barrick which was entrepreneurial, Bristow told media at the Investing in African Mining Indaba. “Barrick was founded by Peter Munk because he saw an opportunity to create a gold group that was not South African. Their driver was cash flow and they did really well. But slowly that morphed into something else. They became corporate and over-weighted with beanies and bankers. That head office in Toronto grew to where at one stage it had 500 people. “So John started a process of cleaning up. He sweated out the debt. If anyone else in the industry had run Barrick from 2015 to 2018 they would have issued a pile of paper. What he did was to force the cash flow out of the assets. “He brought in Chinese partners in two key assets; he sold some assets at a very good price, and he started the reduction in the corporate office. He also cleaned out the corporate culture which is a barrier to a transaction. The biggest problem with mergers is the ‘white-anting’ of the old regime”. Said Bristow: “Barrick’s head office will be down to 70 by the end of the current quarter. John had taken out the top management so we had no resistance, but there’s a lot of embedded inefficiencies in a big organisation like that. “That’s about systems and accountability. I have created three executive teams one of which consists of the old Barrick executive and which will run North America. They know those assets and are very focused on that business. The other teams run South America – which looks after Australasia and Africa. “The Barrick assets were run for cash flow. We are shifting to a system where we will optimise the business against the orebody as we have done in Randgold all the time. “Barrick had got to being a banking-driven business. There was a general shortage of geology; geo-tech and mineral resource management. The assets had gotten so far away from the corporate that you did not know what was going on so you kept getting bad surprises. “That just fuelled an orphan-type approach as far as holding people to account. You very quickly got into the syndrome of saying: ‘if you can’t perform we are going to sell you’ – instead of: ‘if you can’t perform we will find someone who will’ which is a very different system of management”. Regarding his corporate relationship with Thornton, Bristow replied: “I run the company. John runs the board. There’s a role for both in a business of this size and complexity.